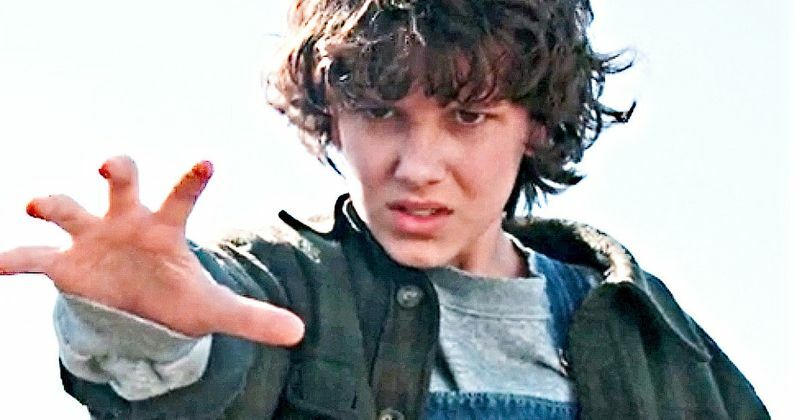 We don't know much about Stranger Things Season 3, but from the looks of recent set photos, it's gong to have one Hell of an ending. And you can already sense all of the cool 80s references in just the handful of images that have leaked, featuring the main cast as they prepare for the fight of a life time. There is no confirmation, but it is rumored that the leaked images this weekend are from Stranger Things' epic Season 3 finale, which will bring the military to Hawkins with a fight against the supernatural monsters at the center of this coming-of-age thriller. And it looks like we're going to get some cool mall action thrown in as well. Stranger Things Season 3 is set in 1985, and will directly reference movies from that year, including Back to the Future, The Goonies, The Breakfast Club, Rambo, Witness, Fright Night, Commando, Weird Science and Return of the Living Dead, all of which have pretty much been referenced before. But this season is also bringing in the Starcourt Mall, the new shopping center that has popped up in Hawkins. This means we're going to get references to such mall movies as Fast Times at Ridgemont High, Dawn of the Dead, Night of the Comet, Chopping Mall, The Blues Brothers and, noted once again, Weird Science. We already now that Steve, played by Joe Keery, is working at the Scoops Ahoy Ice Cream shop in the mall, forced to wear a dopey sailor's uniform as he builds his right bicep scooping rocky road and pistachio. In what could be one of the coolest aspects of the grand Stranger Things Season 3 finale, it looks like Steve will be fighting alongside his friends while wearing this heinous outfit. That has the potential to be one of the all-time great scenes in the series, and we can already see the Funko Pop for Ahoy Steve. What we can take away from these latest set photos is that Mike and his friends have gathered at the Starcourt Mall, enjoying some free time, when the military is called out to face off against what is being called the biggest threat to Hawkins yet. We can tell it's summer time, as Finn Wolfhard, who plays Mike, is seen wearing shorts and a short sleeve polo circa 1985. We also see Winona Ryder's Joyce Byers, who appear in military fatigues for reasons that aren't quite clear yet. She can be seen confronting her son, Will, played by Noah Schnapp. Some heavy stuff is definitely going down. We also get to see Millie Bobby Brown as Eleven, as she enters the fray. She looks as nerdy as ever, having ditched her punk rock look from Season 2. It's not clear that she is hanging out with Mike and friends at the Starcourt Mall when all hell breaks loose. In a few interesting images from earlier in the week, we can see Millie Bobby Brown in her same outfit from the big end fight scene in the finale. Only in these photos, she is clearly at the beach, laying out a blanket, as surfers pass by. Huh, what? You might think Indiana is landlocked, but there are actually a couple of beach fronts in the state, and it looks like The Duffer Brothers are taking advantage of that this season. Eleven is going to the beach for the summer. Let's hope she cranks up some Surf Punks on the boom box. While we're not quite sure what is going down in these images from the Stranger Things Season 3 finale, they look quite epic. And Eleven goes to the beach for the summer. How cool is that? Take a look and hold on as we prepare for Stranger Things return on Netflix. We're not sure when it will be back, but it looks like new episodes will debut sometime this summer. 🚨 Spoiler Alert for Stranger Things Season 3!